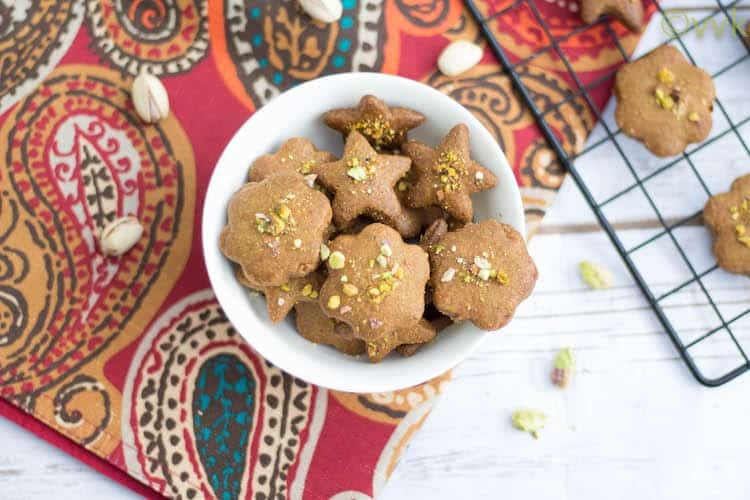 Today I am going to share one of the traditional cookies from Persia, precisely from Iran – Nan-E Nokhodchi | Persian Chick Pea Cookie with Cardamom and Pistachios. 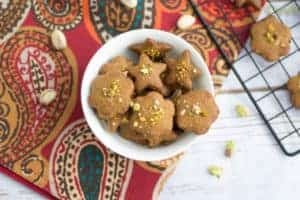 Chickpeas are popular in Persian cooking and this cookie is prepared with roasted chickpea flour. You know what, this is a vegan and gluten-free cookie making it perfect for everyone. 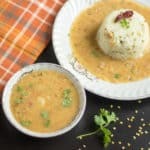 With the delicate flavors of cardamom and rose syrup and chickpeas, this is sure a table winner. Without any further ado, here is the recap from previous marathons and then the recipe. The printable recipe at the bottom. Sieve the chickpea flour and dry roast the chickpea flour for a minute in a pan without any oil and let it cool. If you have roasted chickpea flour, skip this step. Chop the pistachios and set aside. If required, powder the cardamom. Combine all the ingredients oil, sugar, cardamom and rose syrup in a bowl. Mix them together and form a dough. I did not use a hand mixer; I just mixed it with my hand. Dust your work surface with some chickpea flour and knead the dough for 10 minutes until it is more workable. The dough is very crumbly. Wrap tightly in cling wrap and set aside for 1.5 hours. Do not refrigerate. Preheat oven to 300 F and line baking tray with parchment paper. Roll out the dough on a dusted work surface until it is 1/2 to 3/4-inch thick. Cut out cookies using your favorite cookie cutter and place the cookies on the baking tray, spaced 1 inch apart. Repeat the above for the remaining dough. Sprinkle chopped pistachios on top of the cookie. Bake these for 15 to 20 minutes, until the cookies turn a light golden color. Remove cookies from oven and let it cool on tray for a few minutes. Then carefully transfer to a wire rack to cool completely. I used black chickpea flour, so my cookies are brown when compared to the original recipe. 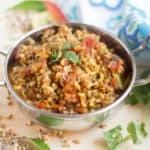 Rose syrup or rose essence or rose water can be used in this recipe. Be careful when you transfer the cookies as they crumble very easily. 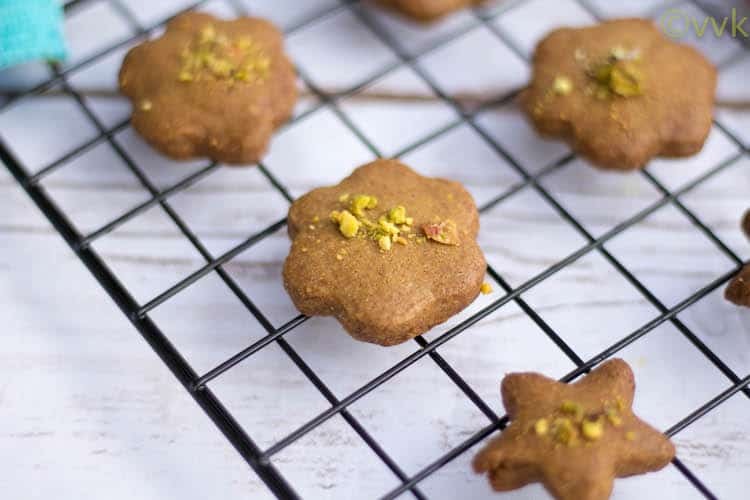 An eggless, vegan, gluten-free Persian cookie prepared with chickpea flour with the delicate flavors of rose syrup & cardamom topped with pistachios. 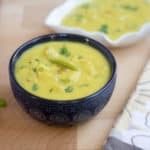 Sieve the chick pea flour and dry roast the chick pea flour for a minute in a pan without any oil and let it cool. If you have roasted chick pea flour, skip this step. Combine all the ingredients oil, sugar, cardamom and rose syrup in bowl. Mix them together and form a dough. I did not use hand mixer, I just mixed it with my hand. 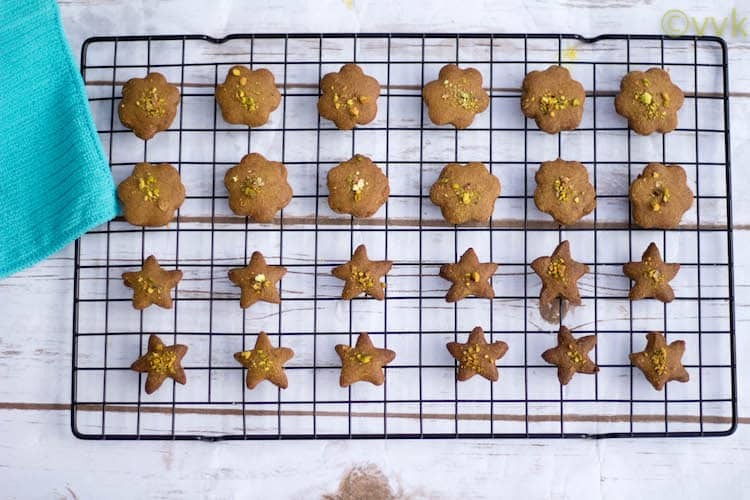 Bake these for 15 to 20 minutes, until the cookies turn a light golden colour. I have this recipe bookmarked for the alphabet but did not bake it. After seeing yours I am tempted even more to bake it. Looks awesome! I want to try this cookie right away!! I am so in love with the ingredients used!! Besan in cookies tasted amazing. I love adding it in my nan khatai . Love the shape. 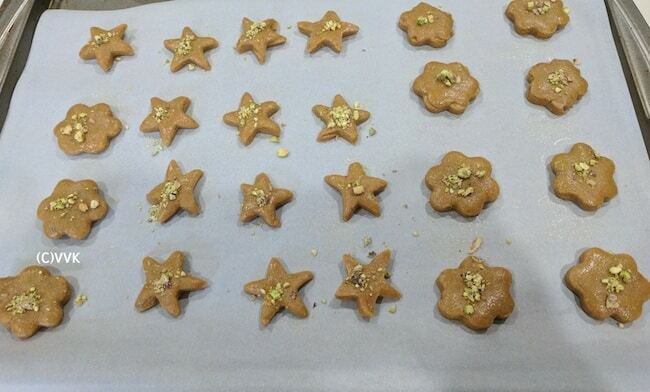 I am yet to bake Nan Khatai… I agree, besan in cookies is awesome. These cookies look sooooo tempting. I’m going to try these some time soon. That’s so wonderful to see a cookie with besan..really too good..is this chickpea flour prepared the same way as ours? Yes Valli. Thanks a lot. Interesting version of the ‘baked mysore pak’ in your words. 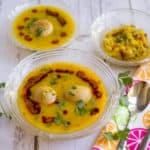 I have never tried baking with besan and this sounds like a good one. 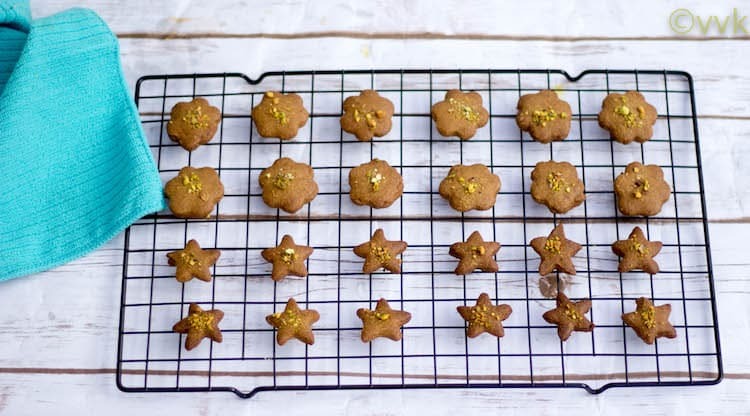 Chickpea flour cookies, wow! That’s a first I’ve heard of it.. they do sound flavorful. Will try them sometime. 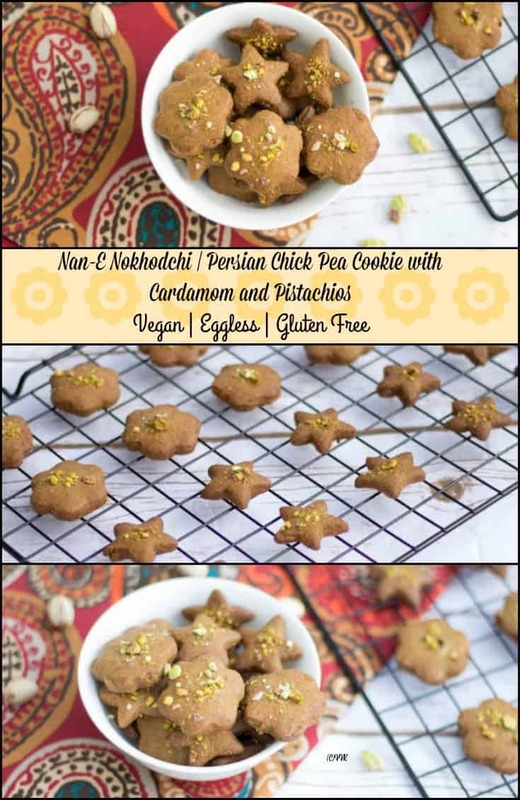 Scrumptious cookies, am in love with this chickpeas cookies and love the nuts and flavor went in it. Cute shaped cookies there. 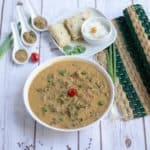 Excellent recipe and I am drooling while reading this recipe . I am a great fan of besan sweets and this is just what I would love . Instantly bookmarked . Once again Fantastic ! ? 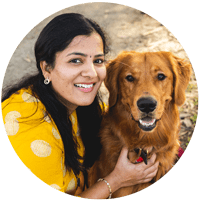 Thank you so much Vaishali. Glad you liked it.